2015 PSLV-C30 ASTROSAT is India's first dedicated space Observatory. PSLV-C38 / Cartosat-2 Series Satellite June 23,2017 PSLV-XL The Cartosat will provide remote sensing services for about five years. PSLV-C40/Cartosat-2 Series Satellite Mission Jan 12, 2018 PSLV-XL Providing high resolution scene specific spot imageries. 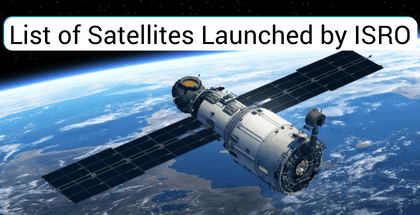 NovaSAR and S1-4 Sep 16, 2018 PSLV-C42 It will help for forestry mapping, land use and ice cover monitoring, flood and disaster monitoring, environment monitoring, urban management. CHANDRAYAN-1 was India’s first lunar probe launched using PSLV-XL. The NASA-ISRO Synthetic Aperture Radar (NISAR) mission is a joint project between NASA and ISRO to co-develop and launch a dual frequency synthetic aperture radar satellite to be launched in 2020. September 2016 GSLV F05 First operational flight of GSLV Mk II. December 2018 Ariane 5 It will help provide satellite-based internet to remote places where cable-based internet cannot reach. India is planning to launch 32 space missions in 2019. The South Asian Satellite, also known as GSAT-9, is a geostationary communications and meteorology satellite operated by Indian Space Research Organization (ISRO) for the South Asian Association for Regional Cooperation (SAARC) region. It was announced by the prime minister of India, Narendra Modi in August 2014, in line with his foreign policy objective of strengthening India’s relations and cooperation with neighboring countries. The satellite launched by 5th May, 2017. GSAT-9 is a Ku-band broadcasting and telecommunications spacecraft which India has developed to provide services to members of SAARC. The GSAT-9 spacecraft is a 2,230-kilogram (4,920 lb) satellite based on ISRO’s I-2K bus. Indian Space Research Organisation (Isro) will launch three communication satellites — GSAT-19 and GSAT-20 — in the coming 18 months to boost internet speed across the nation. NISAR or the NASA-ISRO (American space agency NASA and India's ISRO ) Synthetic Aperture Radar satellite could possibly be the world's most expensive Earth imaging satellite and will cost the two countries over 1.5 billion dollars. In what will be its next step to reach, land on and explore the Moon, the Indian Space Research Organisation (Isro) is gearing up to launch its space science and planetary exploration mission, Chandrayaan-2, on a GSLV MKII launch vehicle, in the first quarter of 2018. A satellite is an artificial body placed in orbit around the earth, they can be either natural or artificial serving different purposes like communication, navigation, weather, earth observation, military etc The example for natural satellite is Moon , which keeps orbiting the Earth. Jupiter has 63 moons while Mercury and Venus have no moon. In 1957, Russia became the first country to launch an artificial satellite “SPUTNIK 1” rocketed by “SPUTNIK 8K71PS”. The Indian Space Research Organization (ISRO) is the space research and exploration agency of the government of India (GOI) headquartered at Bengaluru (Karnataka) aiming to develop and sharpen space research and technology for national development. ISRO was formed in 1969 displacing the Indian national committee for space research (INCOSPAR) established in 1962 with the combined efforts of first prime minister Jawaharlal Nehru and his close aide scientist Vikram Sarabhai ,regarded widely as the Father of the Indian space programme. Dr. APJ ABDUL KALAM (Avul Pakir Jainulabdeen Abdul Kalam ) is known as the missile man of India for his work on the development of ballistic missile and launch vehicle technology. ISRO comes under the authority of the department of space of GOI and the PM, managing agencies and institutes. It has its own commercial wing named “ANTRIX” a marketing arm, its job is to promote products, services and tech development. It was Dr.Vikram Sarabhai’s continuous efforts which persuaded the Indian government to concentrate on space research work and make a place in the elite club of leading space agencies. India launched its first satellite ”ARYABHATA” in 1975 with the help of “KAPUSTIN YAR“ Russian rocket launch site. In 1970s, the project SLV (satellite launch vehicle) headed by Dr.APJ Abdul Kalam with ISRO to develop the technology for launching satellites was in the initial stage and made its first launch in the year 1979 carrying “ROHINI” named satellite to the orbit. The launch vehicle throws the rocket carrying the satellite into different orbits. Subsequently, it has developed PSLV (Polar satellite launch vehicle) and GSLV ( Geosynchronous satellite launch vehicle ). The PSLV took its first flight in 1993 and is breaking records since then, with its latest successful flight on 15 February 2017,carved its name in the history by launching 104 satellites in polar orbit at one go in just a single rocket “PSLV C37” from Satish Dhawan Space Centre (SDSC),surpassing Russian record of 37 satellites in 2014. It carried 3 Indian satellites 1)CARTOSAT-2 series, India’s weather observation satellite2)INS-1A and INS-1B (Indian national satellite ) and other nations satellites including 96 from US alone. With this Indian satellites launched in space now stands at 46 and the total number of customer satellites from abroad launched by India’s workhorse launch vehicle PSLV has reached 180. It has launched various satellites for historic missions like Chandrayan-1, Mars Orbiter Mission (MOM), Space Capsule Recovery Experiment, Indian Regional Navigation Satellite System, etc. NASA ( National Aeronautics and Space Administration), US space agency. ISRO Chairman – Kailasavadivoo Sivan. We have also updated the General Knowledge for Competitive Exams, which covers Science and Technology Knowledge, Inventions and Discoveries etc. that will help to cover General Knowledge Topics for upcoming Exams.